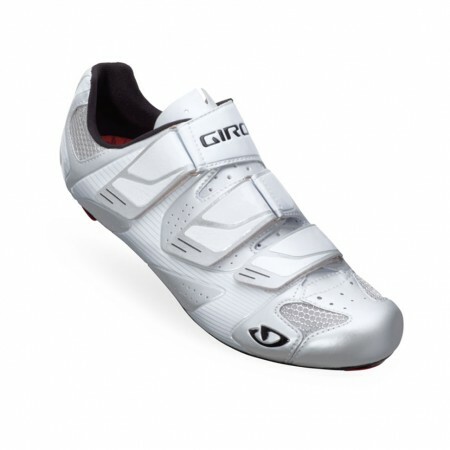 In about 20 years as a cyclist, I’ve owned five pairs of shoes: Diadora, Carnac, Time, Specialized—and now the Giro Prolight SLX. My first three pairs all used three Velcro straps to secure my feet, and my brief detour from the concept (two straps and a buckle) left me underwhelmed. Buckles break, gunk-up, strip, and flat-out fail. Some of them use protruding bolts that—if your foot’s shaped just right—can press painfully against bones or protrusions. And while, Velcro does indeed have the potential to wear out over time, there’s much less of a chance that your strap will snap in the middle of a century—and if it does, you’ve got (hopefully) two more to get you home. So given my foot fastening preferences, I was eager to try the Prolight SLX and its three Velcro straps. Anatomically placed at key points across your foot to provide maximum comfort and stability, the SLX’s straps produce a fit that feels as if your foot is being hugged by the shoe—not strapped into it. And in cases when I did feel the need to cinch down for even more support (before a climb or a town line sprint), the straps were easy to grab, pull, and refasten. But the straps aren’t even the sexist part of the shoe—that title goes to Easton’s EC90 carbon fiber sole. High-modulus carbon allowed Easton to design a sole only 6.5-mm thick, making it light, but also as stiff as anything you’ve ever ridden—if not more so. On my first ride I was impressed by how efficiently power was transferred from my legs to the pedals. It felt as if the shoes were propelling me forward—especially when climbing out of the saddle—a sensation similar to riding with a nice, stiff set of wheels. Titanium bolts complete the package, shaving a few more precious grams. Accessories include a shoe bag and a SuperNatural Fit footbed kit with customizable arch supports and insoles (a tremendous value). Pros: Velcro straps and Easton’s EC90 sole produce the perfect blend of comfort and performance. And there’s nothing quite like white shoes (they come in black as well). 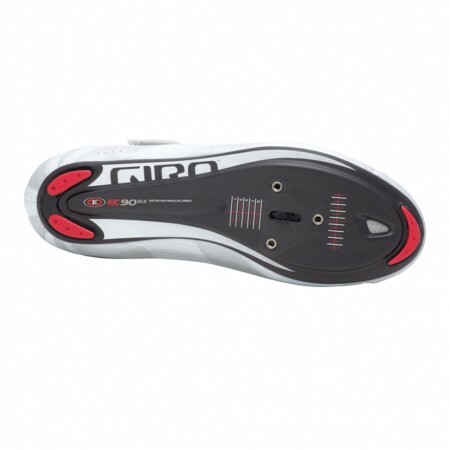 Peeves: The thinness of the sole means you might have to readjust your saddle height after making the switch. While PRO, white certainly loses some luster after a wet ride or two. This entry was posted in Equipment, Featured, Musette and tagged giro, holiday gift guide, prolight slx, shoes. Bookmark the permalink.